Collect precise data, anytime, anywhere. For decades, researchers have tried to study the earth and animals by taking a bird's eye view. But airplanes, helicopters, and satellites aren't truly bird-like. Our solution is. Now, The Spinning Bird gives you access to a new system that makes data-collection more efficient and cost effective, less labor intensive, and less intrusive — all the while enabling scientists to reach some of the world's most remote and hard-to-get-to spots. 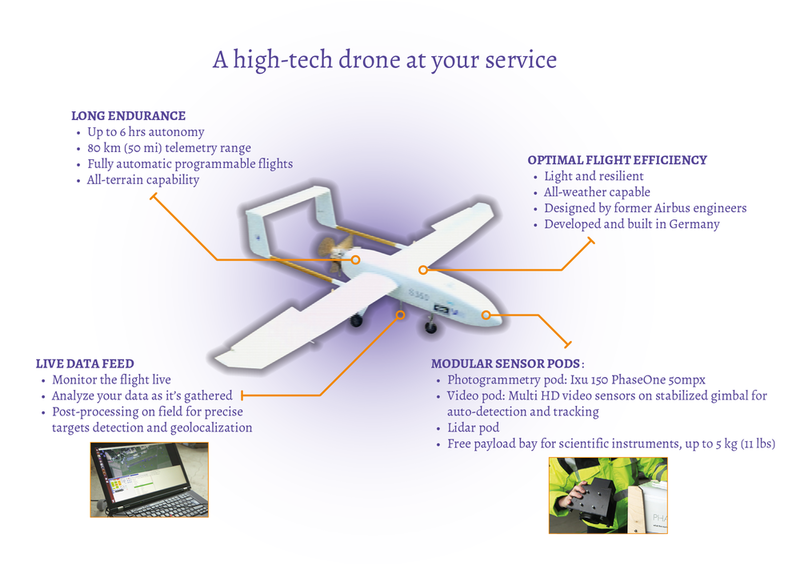 The Spinning Bird's backbone is the S360, a fixed-wing Unmanned Aerial Vehicle (UAV). Developed by former Airbus engineers for long-range missions, the S360's flight is fully automated. 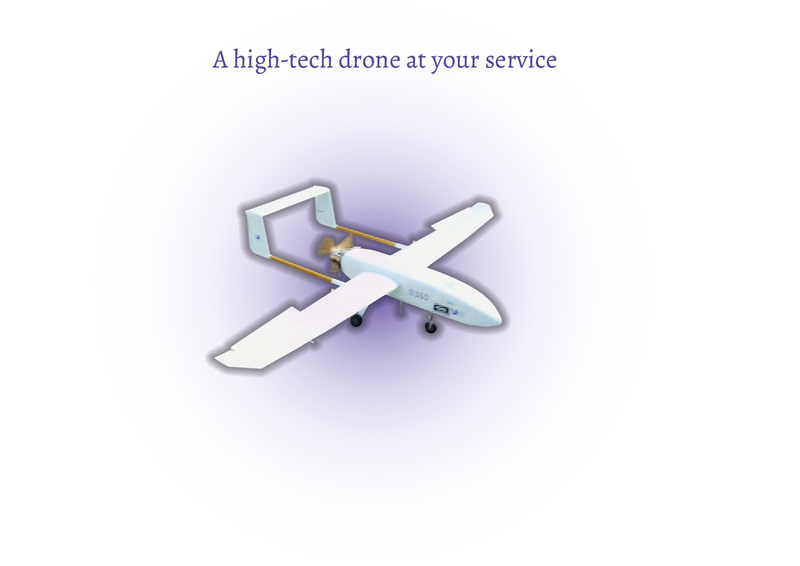 The ground-control station can monitor and control the UAV through all flight phases. The S360 is also highly flexible. The Spinning Bird supplies high-resolution sensors or high-definition gimbals for pinpoint-data gathering. If you need your own sensors, the S360 hauls payloads up to 5 kg. Just fill up the cargo bay and take-off. Finally, The Spinning Bird's data-collection and storage system enables scientists to analyze information in near real time. Post-mission processing just isn't fast enough anymore. With the help of The Spinning Bird, incoming data can inform ongoing research. Imagine the S360 flying over a pod of whales swimming far out at sea. The mammals' location is sent directly to scientists who plot a course to track them. 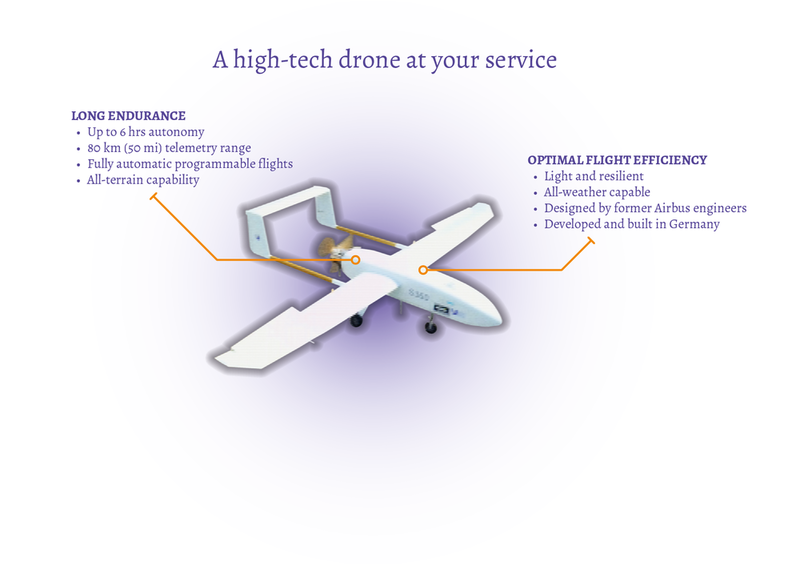 The S360 can fly up to 100km from the point of departure or remain aloft for eight hours. No problem. Whether it's scientific observation, land surveys or environmental or industrial applications, The Spinning Bird is the solution. We're ready to fly for you. Contact us! We're ready to fly for you.